The Buffy-headed Marmoset was discovered by Thomas in 1903. This species is endemic to Brazil. It is currently (2003) listed as an endangered species. 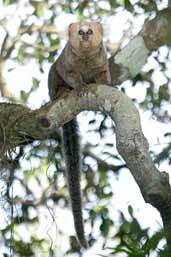 It inhabits a small area of South-east Brazil between the Doce and Paraiba rivers. The Buffy-headed Marmoset weighs on average around 400 grams. They have a dark mask around their eyes and nose. They have black hair down the centre of their chest, and the underparts are buffy. They are also known by the common name of White-eared Marmoset, and sometimes called the White-eared Monkey or Buffy-headed Monkey. An unusual feature about this particular species is its diet. Unlike most marmosets, the Buffy-headed Marmoset eats plant gums as a source of carbohydrates instead of fruit (Ferrari & Mendes 1991). With this unique feature, it enables the Buffy-headed Marmoset to colonise areas where fruit is scared, other Marmosets would not be capable of this. The gestation period for the Buffy-headed Marmoset is around 140 to 148 days. The litter can range between 1 to 4 new born marmosets. This particular species of marmoset is monogamous, maintaining a partner for life.